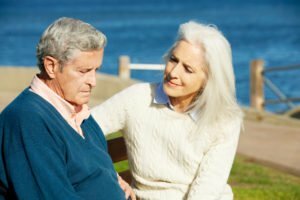 For family members providing dementia home care for a senior with Alzheimer’s disease or another kind of dementia, a number of complex effects have to be very carefully handled, but perhaps the most overwhelming consist of hallucinations, illusions, and suspicions that other individuals are out to cause him problems or ill will. False perceptions such as these arise typically in the more advanced phases of progressive dementia as a result of changes within the brain. It’s essential to first recognize the reasons behind these emotions and behaviors, and to deal with the root cause. Causes for hallucinations may perhaps be the result of a general confusion, a medicine side effect or an infection. Seek advice from the doctor to rule out medication side effects or infections, but also monitor the person’s environment. If the person keeps hearing someone talking: Is a TV or radio on in a different part of the home that may be creating the issue? If the senior believes he/she is continuously being observed: Try pulling curtains closed over the windows. If the person sees insects shifting on the walls: Is there a patterned wallpaper on the wall that may possibly be triggering the perception? When illusions do happen, don’t dispute about whether or not they’re real, but instead evaluate the situation, reassure the senior in a calm voice and adjust the atmosphere as required or reply to the individual’s feelings. An older adult with dementia might accuse others of stealing things, of improper behavior or of betrayal. This could be the result of a general confusion or memory loss, but can also be a way for the older adult to express fear. Take “no” out of your vocabulary. Never debate, become offended or attempt to convince the individual otherwise. Reassure the individual, letting him or her share feelings. Try and give a simple solution to the allegation. Redirect; for example, distracting the senior with an alternate task. Respond to the requirement as opposed to the words. Maintain duplicates of regularly lost objects, such as a pocketbook or wallet. If one is missing, the alternate can be presented. It is no doubt that providing dementia support for a senior with Alzheimer’s disease can be daunting at times. It’s vital to depend on the support of other individuals for advice, resources and respite from the day-to-day duties. Call on the Novato in-home care services of Hired Hands Homecare. We provide home caregivers who are expertly trained in the art of patient, innovative dementia care strategies to ensure your loved one is safe, comfortable and thriving.